According to a Los Angeles Times report, Major League Baseball will announce today that Los Angeles Dodgers outfielder Manny Ramirez will be suspended for 50 games after testing positive for a performance-enhancing substance. While the test may be tied to a medical condition (as he’s expected to say later today), the perceptions within the hobby may well be that he’s just another tainted player from an era where stars who put up legendary numbers are shrouded in clouds of controversy. Guilty or not, more than a few fans have probably already made up their minds and associated him with known cheaters and those mired in controversy regarding their reputations and their statistics from the field. Upper Deck released basic product information and preview images on Thursday for its 2009 Ballpark Collection set that is scheduled to arrive in late-August. There will be three memorabilia cards or one autograph and two memorabilia cards per pack. Each pack will contain one dual memorabilia card and one quad memorabilia card, while there will be cards with as many as eight memorabilia pieces embedded into them. Each four-pack box will include two autographed cards. 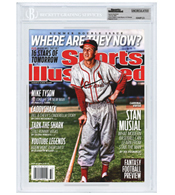 New this year will be All-Time legends cards of Joe DiMaggio and Ted Williams available as dual-, triple-, quad-, six-piece and eight-piece memorabilia cards. See those and more after the jump. 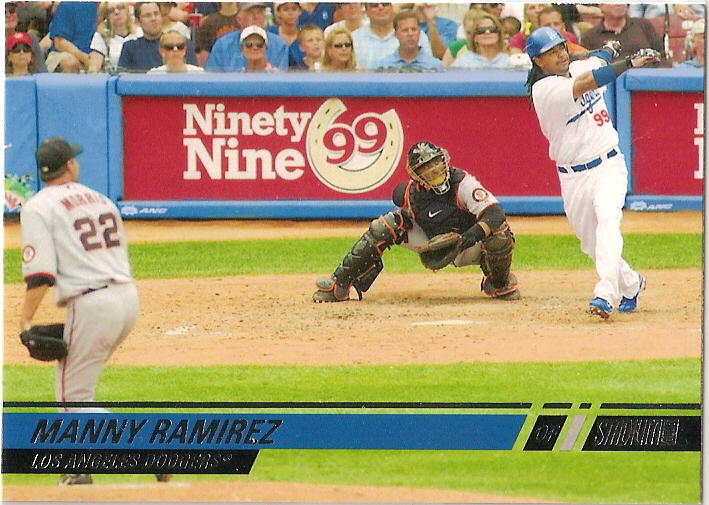 Examine the photo on this 2008 Stadium Club Manny Ramirez card closely. Don’t see anything odd? Head on over to the Cardboard Icons blog where Ben Aguirre Jr. and I have discussed it. 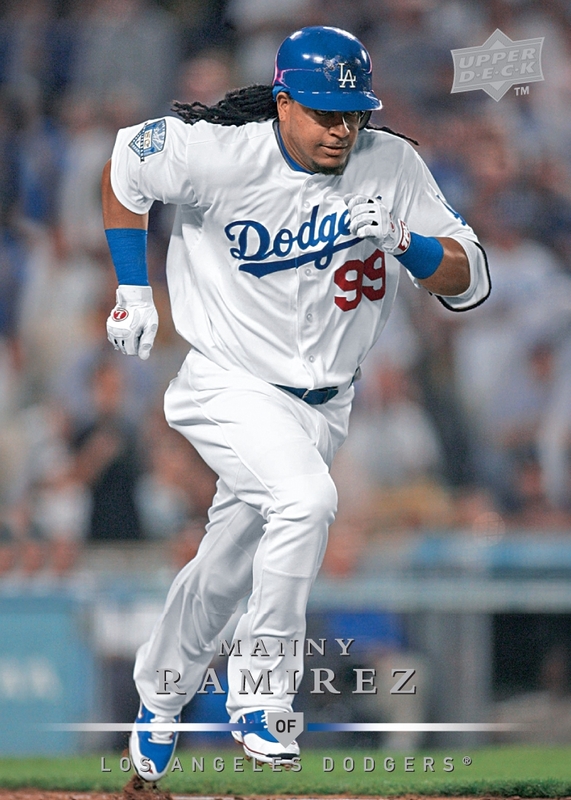 The November Beckett Sports Card Monthly cover star — Los Angeles Dodgers slugger Manny Ramirez — hasn’t yet appeared on an official widely produced MLB trading card in a Dodgers uniform. But don’t worry Dodgers fans — he will undoubtedly have several update set appearances in his new threads. Here’s what his card in the upcoming Upper Deck Update boxed set (arriving in hobby shops on Nov. 11) will look like. If the Dodgers own some extra bling-bling at that time (they’re down 0-1 in the NLCS right now), this card could get pretty hot — at least for a standard card. I need to find new sources of MLB rumors. In all the places I read today, with 1,000-scenarios-a-minute trade deadline coverage, the Dodgers weren’t even mentioned as a landing spot for Manny Ramirez. Manny to LA, Bay to Boston, and Andy LaRoche and pitcher Bryan Morris to the Pirates, reportedly along with a few minor leaguers. I am pretty confused by LA…what do they do now that they have a ton of outfielders on the squad? Boston fans can be content in the fact that Jason Bay has never had a David Ortiz hitting behind him. Plus, he is FAR from done in the big leagues. Pittsburgh fans…well…aren’t the Steelers predicted to be pretty good this season? Chicago…are you ready for this? Wow, it will take some getting used to for sure! It’s not your fault, Pudge! Also, the Washington Nationals traded minor league pitcher Jhonny Nunez to the Yankees for SS Alberto Gonzalez. In 2005, Baseball America listed Gonzalez as the #1 defensive IF in Arizona’s minor-league system, he was a part of the Randy Johnson deal in early 2007. Nunez used to be in the Dodgers farm system. In 2006, playing with the Gulf Coast League Dodgers (rookie ball) he struck out 56 batters in 57 innings. Those are nice K numbers, but look at the stats of the Dodgers #1 pick, Ethan Martin. I know these are high-school stats, but I don’t care if they are from Pony League, they are darn impressive! As a high school senior, Martin, the 2008 Georgia State High School Player of the Year, went 11-1 with a 0.99 ERA and 141 strikeouts…in 79 innings! Nothing to do with the trading deadline, but it’s worth noting since he signed a deal for $1.7 million last month, and now is out for the rest of the year with a knee injury. Good luck in recovery, Ethan! Is Griffey going to the White Sox, or not? We are still waiting on the old “Commissioner approval,” to know for sure. It’s bugging me, so I can’t imagine how White Sox fans are doing right now. By the way, I forgive you all for 2005, never had any hate there. What about Manny to the Marlins? As much as the media makes him into a jerk (and he may well be), I can’t see the Red Sox fans being overjoyed at the thought of a Manny-less lineup tomorrow. Uploads are down, so repeat images used-We are so very sorry! This is proving to be a long day of waiting and wondering. Especially since WordPress is messed up and photos are not uploading right now…grrrr….